Julio Mwambire and Japhet Garama of Dakatcha Woodland Conservation Group (DWCG) have found the second confirmed breeding site for Clarke's Weavers in the world. Like the first breeding site, it is in Dakatcha Woodland Important Bird Area northwest of Malindi. 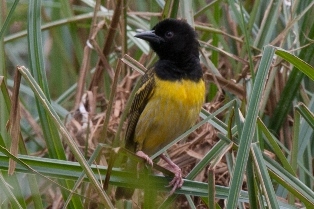 During monthly bird monitoring organized by Nature Kenya, Mwambire and Garama recorded large flocks of Clarke's Weavers at Munyenzeni wetland near Bore viewpoint in late April, but no breeding activity. Then on 9 May 2015, Mwambire and Garama found Clarke's Weavers building nests among the sedges in a pool of the seasonal Gandi River. On May 21 and 22, Rupi Mangat, Catherine Ngarachu, Brian Wambua, Albert Baya and I joined Mwambire, Garama, Peter Wario and Samson Katisho of DWCG on to view this second Clarke's Weaver breeding site. The sedge-filled pool in the Gandi River was busy with weavers. We could see male and female Clarke's Weavers sitting in the tops of the sedges, and estimated about 80 Clarke's Weaver nests. Some of the birds were shivering their wings, apparently in display. There were also a number of Grosbeak Weavers with nests, and flocks of Red-headed and Red-billed Queleas. Male and female Clarke's Weavers flew and off and soon returned with food in their beaks to feed the young in the nests. The adults brought mainly insects, including caterpillars and grasshoppers. They continued to bring food all morning, and the next day we watched them bringing food in the afternoon. Yesterday, June 11, Julio Mwambire reported "Now young ones flying around perching on the shrubs in the wetland and the bushes, in small flocks joining adults flying to the feeding grounds". It seems that we can report a successful Clarke's Weaver breeding event in Dakatcha Woodland IBA.